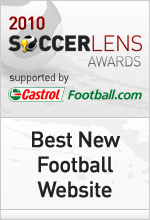 1) You’ve been nominated for Best Football Site, chosen by both fans and industry experts, how does it feel? It feels warm and cosy. Like a Cup of Soup on a cold winter’s night. But seriously, it is always good to see that someone out there appreciates what we’re doing. 2) What kind of year has 2010 been for Caught Offside? It’s been a good year, traffic sky rocketing and a plethora of new writers on board to bring a greater variety of content. All in all 2010 has been very positive, but 2011 will be even bigger! Given the masses what they want, when they want it. Be that features, rumours, highlights, irreverent nonsense and the occasional smattering of bare flesh courtesy of a WAG or two. We would say without a flicker of hesitation that Dirty Tackle and Four Four Two would vie for our vote. 5) What’s next for Caught Offside? Expansion, a new site design and whatever else is needed to achieve yet more in the way of world dominance (cut to creepy Mad Professor laugh).